From an usability standpoint, the biggest new is that now you can silence the XSS filter not just whitelisting ("Always allow requests from... to...") but also blacklisting ("Always block..."). NoScript Quantum 10.1.4 is out, and while it might seem a fairly minor release, it does fix some performance issues under the hood and a quite annoying bug making maximized windows "jump down" when you open the NoScript UI. Talking of which, now that these back-end cleanup is done, I can finally give some more love to all the suggestion about improving usability that you kindly provided so far. 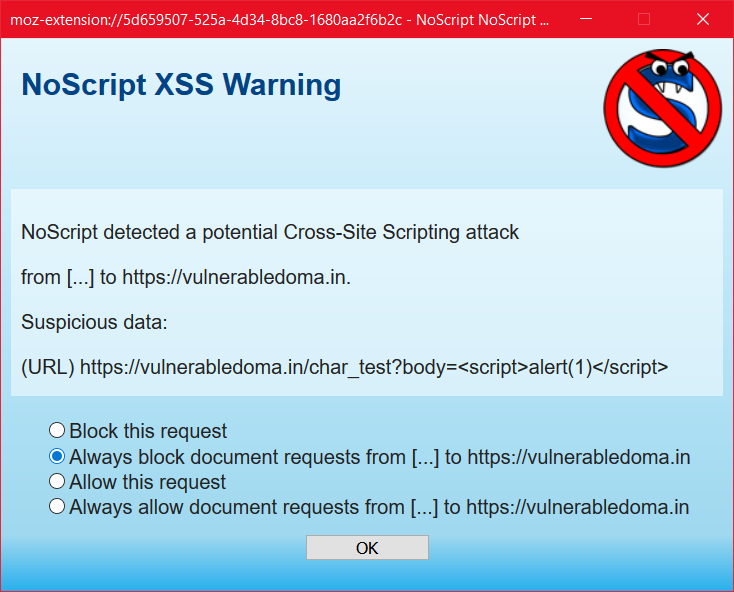 Starting with the XSS popup, which unfortunately cannot be an "old style", interactive but out of your way, notification anymore because of limitations in the WebExtensions (I cannot even open the NoScript menu programmatically, it must be reacting to user's input); but can, for instance, include an "always block requests from a.com to b.com" to make it less noisy.